Kabul’s foreign policy approach has shifted between favoring India and Pakistan since the partition. Afghan President Ashraf Ghani, speaking at the sixth Heart of Asia Conference in Amritsar, India, not only criticized Pakistan but, importantly, also rejected $500 million in aid from Pakistan, recently pledged at the Brussels conference in Europe. Ghani’s rejection marked the lowest ebb of bilateral relations between Kabul-Islamabad in the last 15 years and particularly during the rule of the National Unity Government (NUG) in Afghanistan. True, Kabul-Islamabad’s honeymoon ended long ago, and the NUG has snubbed Islamabad already since Pakistan’s failure to bring the Taliban to negotiating table for promised talks in March 2015 and later in March 2016. However, Ghani’s latest remarks are the first time in the last 15 years that Kabul has rejected a nation’s aid. This change in Kabul’s Pakistan policy sparked enormous reactions in both Afghanistan and Pakistan. Reactions in Kabul, however, were mostly positive. The Pakistani reaction can be clearly understood by a look into Pakistani print and electronic Urdu and English media, where Ghani’s snub was covered widely initially and then vanished from headlines as media turned their attention to news of singer-turned-preacher Junaid Jamshid’s death in an airplane crash. Unfortunately, when it comes to Afghan, Indian, and Pakistani foreign policies regarding each other, they do not look through the prisms of bilateral relations. There is always a triangle, which deeply influences their policies. Pakistan’s Afghan policy is very much India-centric; Indian policy in Afghanistan is heavily influenced by the desire for a security and psychological advantage over Pakistan. Meanwhile, Kabul uses the Pakistan-India cards in a manner similar to Afghan leaders balancing Czarist Russia and British India during the “Great Game.” From the Cold War through modern-day, Kabul has varied in its closeness to India and Pakistan, with gains by one side coming at the expense of the other. The independence of the Indian sub-continent from the yoke of the British Empire and its subsequent division had a knee-jerk effect on Afghan foreign policy because of the disputed “Durand line” agreement with the British Empire, which was never accepted and probably will never be officially recognized by Kabul. Pakistan’s emergence not only changed South Asian politics and its map but also transformed Afghanistan’s internal and external politics, literature, and psychology. Ever since 1947, Kabul’s Indo-Pak policy has been a most debatable topic in Afghan foreign policy, with debates over whether Afghanistan should balance between Delhi-Islamabad, tilt more toward India, or approach Pakistan for peace and security. Historically, Kabul’s Indo-Pak policy has been a mix of idealism, pragmatism, and realism. Whenever Pakistan arrested or imprisoned Pashtun and Baloch nationalist leaders during the Cold War, Kabul would reply with rhetoric. Moreover, Kabul harshly criticized Pakistan’s move to merge the various provinces of West Pakistan (nowadays Pakistan) into one unit to defuse rumbling discontent in East Pakistan (now Bangladesh). This Afghan policy was very much influenced by “Pashtunistanism,” driven by idealistic and principled causes (i.e. supporting Pashtuns and Balochs’ right to self-determination, not recognizing the Durand line, and most of all continuing to claim as Afghan land territory lost in the 1893 Durand agreement, parts of today’s Khyber Pakhtunkhwa and Balochistan provinces in Pakistan). Due to this policy, Kabul was even led to give sanctuaries to those Baloch and Pashtun nationalists and separatists who wanted separation from Pakistan. Later, Pakistan did the same when the young leaders of the Islamic movement of Afghanistan, such as Gulbuddin Hekmatyar, Ahmad Shah Massoud, Burhanuddin Rabbani and others, went to Pakistan to get training. However, contrary to this general policy, at the same time, Kabul chose a non-aligned or impartial stance between Delhi and Islamabad during the Indo-Pak wars in 1965 and 1971. In fact, at the height of bilateral tensions with Pakistan, Kabul even proposed a confederation between Pakistan and Afghanistan as illustrated by former Pakistani ambassador to Kabul Aslam Khattak in his book A Pathan Odyssey and quoted by former Pakistani foreign minister Khurshid Mahmud Kasuri in his book Neither a Hawk nor a Dove. During Afghan President Daud Khan’s last years, an opportunity emerged for both countries to solve the important bilateral issue of the Durand line. Daud Khan and Pakistani Prime Minister Zulfiqar Ali Bhutto was close to an agreement to stop using their soils against each other and handing over opponents. However, the communist coup in Afghanistan and Zia-ul-Haq’s coup in Pakistan shattered these dreams. The communist government in Afghanistan, which was superseded by a Soviet invasion, badly affected the Afghan people’s relations with India and, conversely, relations with Pakistan improved. Pakistan financially, diplomatically, and militarily supported the Afghan mujaheddin and hosted more than five million Afghans, while the Indians instead had close relations with the Afghan communist government and did not openly condemn Soviet aggression. After the withdrawal of Soviet forces from Afghanistan, India was mostly isolated from the Afghan political landscape for the first time since its independence from the British Empire in 1947. New Delhi had very limited contacts with the eventually successful Afghan mujaheddin during the Afghan jihad (1979-1989); instead India’s relations with the communist government in Afghanistan were stronger. However, when Burhanuddin Rabbani became Afghanistan’s president, relations between Kabul and India improved. New events forced Rabbani to think that Pakistan was backing Hekmatyar’s Hezb-e-Islami, which had brought Afghanistan to the verge of civil war, with the main purpose of toppling Rabbani’s government. A former Pakistani foreign secretary and Afghan desk officer, Riaz Ahmed Khan, in his book Afghanistan and Pakistan: Conflict, Extremism and Resistance to Modernity writes that when a top commander of Jamiat-e-Islami, led by Rabbani, and the defense minister of the mujaheddin government Ahmad Shah Masoud formed “Shura-e-Nazar” to fight the Soviet invasion, Pakistan viewed this “as a newly negative element in afghan politics which at any given time can act against Pakistani interests.” This shows Pakistan’s dissatisfaction with Jamiat-e-Islami and Rabbani’s government. When the Afghan Taliban emerged in the Afghan political landscape, the situation became further complicated. This was the first time in Afghan history that Kabul’s bilateral relations with Islamabad were much improved compared to Delhi. During the Afghan Civil War and fighting between Hezb-e-Islami (led by Hekmatyar) and Jamiat-e-Islami (led by Rabbani), India was aligned with Jamiat-e-Islami. When the Taliban emerged, India kept supporting Jamiat-e-Islami and the Northern Alliance, established just after Taliban won Kabul in 1996 by Ahmad Shah Masoud, a commander of Jamiat-e-Islami. The Indian support for the Northern Alliance affected the Taliban’s mindset and that is why the Taliban government never tried to improve diplomatic relations with Delhi. Meanwhile, the Taliban had Pakistani support starting from its first large military operation along the Pakistani border. Thus, during the Taliban’s Emirate in Afghanistan, Afghan-Pak relations were closer than ever, and for the first time in bilateral history, Islamabad succeeded in gaining “strategic depth” in Afghanistan (“strategic depth” is a controversial term, but one of its features is to limit close Indo-Afghan strategic and security relations). Pakistan also used afghan soil as a launching pad and a training center of extremists against India. On the other hand, not all Afghans were positive toward Islamabad. When Herat, a major city in western Afghanistan, fell into Taliban hands, in retaliation some Afghans set the Pakistani Embassy in Kabul on fire because of Pakistan’s support for the Taliban. After the U.S. toppled the Taliban government, Hamid Karzai became Afghanistan’s new president. During this whole period, from 2001 to 2014, Afghanistan-Pakistan relations moved toward chaos rather than harmony. Generally Kabul’s Indo-Pak policy was very much pro-India. This habit was influenced by the fact that both countries had provided sanctuaries to the groups opposing each other’s government in the Cold War period. This affected strategic mindsets in both Afghanistan and Pakistan. However, in 2009, Karzai’s relations with new U.S. President Barack Obama fall flat. As a result, Kabul’s sought to improve relations with regional countries such as India, China, and Russia. It was in this period that Afghanistan signed one of its first strategic agreements with India, which include the acceptance of Afghanistan’s nearly six-year-old request for India to train Afghan security forces. Moreover, ahead of 2014 U.S.-NATO troop withdrawal, Kabul approached India with a weapons wish-list, including “150 battle tanks, 120 (105 mm) field guns, a large number of 82 mm mortars, one medium lift transport aircraft (AN-32), two squadrons of medium lift and attack helicopters and a large number of truck.” In addition, more than 1,400 Afghans were sent to India for military training. The motive behind Karzai’s multilateralism and regionalism was very much influenced by his relations with the United States, which labeled him “not an adequate strategic partner,” combined with the perception that Pakistan was behind the rise in insecurity in Afghanistan and the announcement of U.S.-NATO withdrawal. Kabul’s relations with Pakistan deteriorated in Karzai’s second term because of insecurity in Afghanistan, and Kabul’s romanticized vision of Delhi (particularly when it comes to security and strategic relations). Meanwhile, Pakistani security forces arrested those Taliban leaders who had opened “peace talks” with Kabul, such as Mullah Baradar, the second in command in the Taliban hierarchy, and provided sanctuaries to fighters involved in militancy and insurgency in Afghanistan That is why in this period, Kabul’s policies became more pro-India compared to Karzai’s first term. Under the National Unity Government in Afghanistan, led by President Ashraf Ghani, the bilateral relations between Afghanistan and Pakistan were inversely proportional to bilateral relations between India-Afghanistan. In the past two years, the Afghan-Pak bilateral relations passed through difficult periods; compared to Kabul’s relations with its other neighbors, Afghan-Pak relations were more unstable, suspicious, and skeptical. However, things were not always so bleak. Ashraf Ghani’s Islamabad-Delhi policy actually passed through three phases since the formation of NUG until now. After the formation of NUG, Ghani tried to secure Pakistan’s help to stop the insecurity and bring enduring peace to Afghanistan. The new president felt that Pakistan was behind the violence; therefore if Kabul removed Pakistani concerns it might help Afghans. The Afghan side reasoned that the primary Pakistani concern in Afghanistan is the Indian factor and so Kabul must compromise on this issue temporarily, if not permanently. That was why Kabul tilted toward Pakistan and worked hard to boost relations. After the formation of NUG, the Afghan president didn’t visit India for 7 month to please Pakistanis; Kabul also declined Indian heavy weaponry probably to appease Pakistan. On the other hand, Kabul sent afghan soldiers to Pakistan Military Academy for training and signed a memorandum of understanding on intelligence sharing with Pakistan’s Intelligence Service (ISI). Kabul also worked hard to crack down on Afghanistan-based groups targeting Pakistan. Afghanistan handed over a deputy of Tehreek-e-Taliban Pakistan (TTP), Latifullah Mehsud, who was arrested in Afghanistan in Octover 2013 to Pakistan. Kabul later arrested suspects of Army Public School massacre in Pakistan in December 2014 on the basis of intelligence provided by Pakistan and even started military operations against TTP in Afghanistan and killed many of its leaders. Due to this changing Afghan policy, the bilateral visits Pakistan and Afghanistan increased to a level never seen in the past 15 years. The Pakistani prime minister, foreign affairs adviser to the PM, chief of army staff, head of ISI, Pashtun nationalists, and other political and parliamentary leaders frequently visited Kabul and promised to bring the Taliban to the negotiating table. Kabul’s Pakistan policy slowly changed after Islamabad’s failure to take concrete measures against the Taliban or bring them to negotiating table. Instead, insecurity and bomb blasts jolted Kabul many times. After the first official talks with the Taliban in Murree, news of the death of Taliban leader Mullah Omar leaked, which not only sabotaged the Afghan peace process but also became the starting point for a fresh and deadly wave of bloody attacks in Afghanistan. It was due to this that Ghani first said Pakistan was engaged in an “undeclared war” in Afghanistan. Therefore, Kabul tried to uplift Indo-Afghan relations where it was left at the end of Hamid Karzai’s presidency. Afghanistan first sent Afghan Chief Executive Officer (CEO) Abdullah Abdullah to India in mid-March 2015; Ghani also visited India in the next month, April 2015. Kabul was keen to put the bilateral relationship back on strategic track and thus it repeatedly requested the Indian side to hold meetings of Strategic Partnership Council under the Strategic Partnership Agreement. However, as noted above, the Indians rebuffed Kabul on this. Later Afghanistan’s national security advisor, Hanif Atmar, and deputy foreign minister, Hekmat Khalil Karzai, went to India in November 2015 and raised this issue along with requesting attack helicopters. Today, Afghanistan’s policy has entered a third phase, in which Kabul moved far away from Islamabad and, importantly, toward Delhi just because the failure of Pakistan to fulfill its promises, first made in bilateral meetings and then at Quadrilateral Cooperation Group meetings. The diplomatic moves from both Afghanistan and India in the second phase paved the way for smooth strategic and security relations. However, along with the rise in insecurity, the highest-ever number of civilian casualties, and the fall of many Afghan districts into Taliban hands, the attacks on Pathankot air base and Uri army base in India became magnetic reasons for closer Indo-Afghan relations. Both countries are now working together to isolate Pakistan at the regional level. They signed the Chabahar transit and trade agreement, along with Iran, as a way to marginalize and bypass Pakistan when it comes to bilateral trade between Afghanistan and India and Afghan transit. More overtly, India and Pakistan (along with Bangladesh and Bhutan) boycotted the 19th SAARC Summit, set to be held in Pakistan. As a result, the SAARC summit had to be canceled. In this period, India not only delivered four Mi-25 attack helicopters to Afghanistan, but Kabul, once again, turned to Delhi for heavy artillery in a wish list handed over by the Afghan chief of army staff to the Indian side recently. 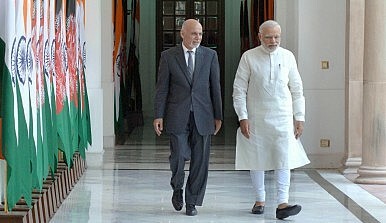 The bilateral exchanges between Kabul and Delhi also increased; since December 2015, Ashraf Ghani and Indian Prime Minister Narendra Modi have met more than five times. India has also participated at a high level in those international conferences concerning Afghanistan. Ghani also quoted a Taliban official, Rahmatullah Kakazada (Taliban’s consulate general in Karachi, Pakistan, during Taliban Emirate at the end of 1990s), whom The Guardian cited as saying that the Taliban insurgency would not survive a month if it lost its sanctuary in Pakistan. (Kakazada soon denied the remark, and said that he was misunderstood or misquoted by the Guardian reporters). The former Afghan president, Hamid Karzai, had implemented a similar Pakistan policy. The difference is that today majority international diplomatic opinion is in favor of Ghani, because of his initial outreach and friendliness to Pakistan. The future of Afghan-Pak ties, as Ghani said in an interview with The Hindu, depends on whether Pakistan’s leadership “takes action beyond its verbal assurances” or not. Kabul, entangled in a difficult situation, will not open the door for improved ties; it is Pakistan that must make the first move for the improvement of bilateral relations and regional socioeconomic development and security. However, improvements to Afghanistan-Pakistan ties will not come at the cost of Kabul’s relations with India this time. The Rise of Taliban DiplomacyThe Search for a Missing Peace in IslamabadIs the Taliban’s Former Capital Ready to Welcome Them Back?The Afghan Endgame: What, When, and HowCan the Afghan State Survive the Peace Process?